Alright, I'm back in action. 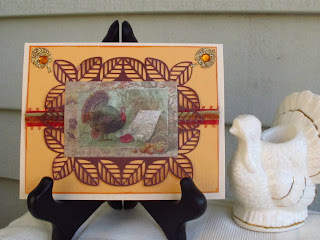 I have some new Thanksgiving Day cards to share with you. These are a little different from the ones I usually make. I always search through the clearance bin at Michaels and I found some Tim Holtz seasonal packs. These have some awesome images with such a wonderful vintage look. So I decided to go with it. As a member of the Cricut Circle, one of the perks is that you receive exclusive carts. 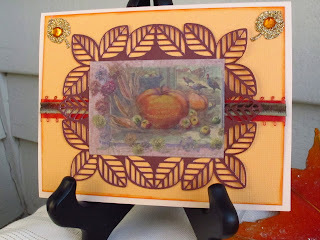 The latest one is called Sophie and that is where I found the die cut of the leaf frame. It was cut @ 4.53 x 3.44" on a beautiful burgundy background. I love how intricate these cuts are. I chose certain sections to highlight with diamond glaze for a glossy look. I also added a beautiful orange card stock as a backing and trimmed it with a rust picot satin ribbon topped with a velvet trim. 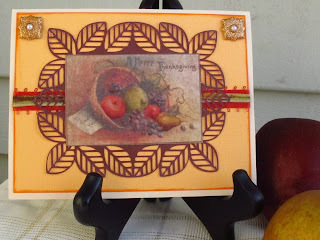 I also had some glittered leaf embellishments that I added to the corners after I distressed the edges with some ink. Don't ya just love my ceramic turkey? I actually have two of them which are my candle holders for the big feast! I just love these images. This is so nice with the turkeys in the background. This has to be my favorite image in this group. I love the cornucopia maybe because i make so many of them at work for the holiday! I also decided to finish this off with an inside verse that was printed in brown on a parchment paper. 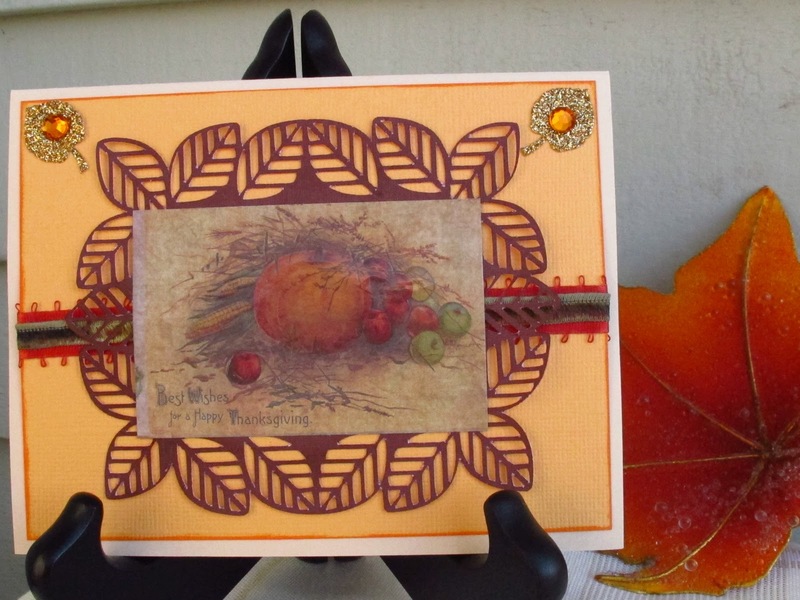 I have decided to add some greetings on my cards this time. It adds weight to the card but gives it a nice finishing touch. What do you do for family traditions at your house? I'd love to hear if you'd like to share! Wow, Mary,these cards look beautiful!!! I'm going to say you did a terrific job creating them! LOL!